An artist's impression of the skate park facility in Pegswood. The parish council is in the process of putting together a planning application for the scheme. Work on a long-awaited youth facility in Pegswood is set to start soon after councillors agreed to go ahead with a revised scheme. The parish council has been working on plans for a new skate park for a number of months and more than £50,000 has been allocated from its reserves, with a further £4,700 earmarked through the ‘seed funding’ process. Other monies totalling £17,500 are in place and it had applied to the SITA Trust for a £45,540 grant, but this was turned down as Northumberland County Council still needs to sort out the lease arrangements for the site, which is located in Welfare Park. At a recent meeting of the parish authority, environment working group chairman Paul Williams outlined the two options available. Scheme A would involve no external funding and the proposed bowl would be replaced with other features. Scheme B would retain the bowl, but the £45,540 amount would be required through one or more funding applications. Coun Williams said: “We recommend going with scheme A. “Scheme B would delay the project further because any external funding would not arrive until the end of the year at the earliest and there is no guarantee that our application or applications would be successful. It would be desirable to go ahead with this option, but it would be very risky and scheme A is not that different to scheme B. After members decided to go with scheme A, Coun Williams added that the ideal scenario is for it to be ready in time for the school summer holidays. The L-shape design includes a smaller arm – which will have a stair set, half-penny and gap kicker and a number of rollovers – for less experienced skateboarders. Instead of a bowl, the area for those with more experience will contain a ramp, ramp extension, spine and volcano features. There is also a hubba ledge and step up in the corner section. In a survey of Bothal Middle School pupils, dozens of them said that they would regularly go along to a skate park in Pegswood. 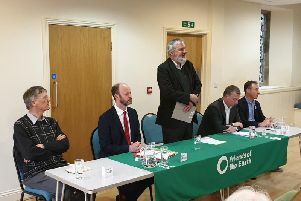 The parish council’s clerk, Kevin Cassie, reported that the county council said the lease arrangements have taken longer than anticipated because there is land in trust through a charity and the Coal Industry Social Welfare Organisation had to be consulted. The Northumberland authority is ‘expecting to have the lease in place by March 31’ and the parish council is in the process of putting together a planning application. A contractor has been appointed, so it will be able to start work as soon as everything gets the green light. The other funding is coming from county councillor Alan Sambrook’s small grants fund (£10,000) and Coun David Woodard’s small grants underspend (£7,500). There is still a shortfall of £8,000 and an area of the 2015/16 budget may need to be slightly trimmed, although Mr Cassie said most or all of the shortfall could be covered by the underspend in the current budget – he will give an update on what this figure is likely to be at next month’s meeting. The council also has contingency monies in place to cover what may come out of its noise assessment. Mitigation measures could be required.